“The Unbreakable Kimmy Schmidt” has become a Netflix hit with a lead character whose personality and optimism was undiminished by years spent as the captive of a criminal passing himself off as a religious leader. This week’s new movie Una presents a much more dramatic – and realistic – about the toll sexual abuse of minors takes on someone throughout their life. 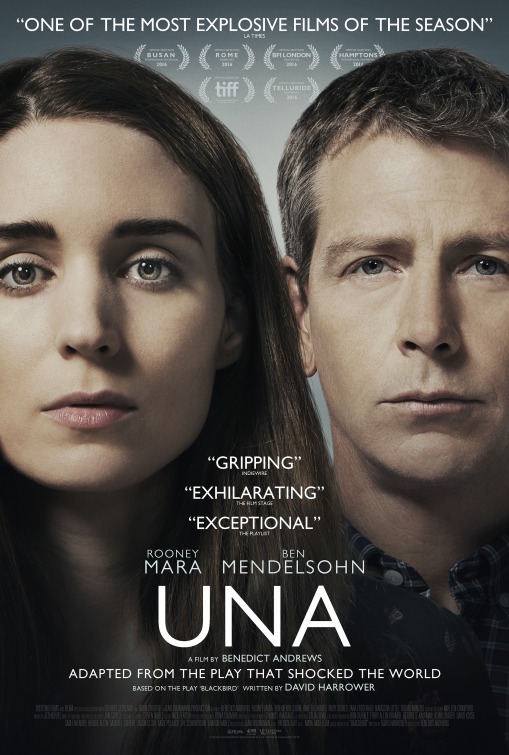 Rooney Mara plays the title character, a grown woman still dealing with the emotional scars left by an affair she had with a much older man (Ben Mendelsohn) when she was just 13. Seeking answers as to why he did it, she searches for him. Eventually she finds him, but the confrontation opens wounds and leads to revelations that neither anticipated. “Absence makes the hurt grow stronger” is the copy that’s written on Mara’s cheek as we see a close-up of her face looking sadly slightly to the side of the camera. Those two elements are about all the hint we get about the story, but it’s clear it’s going to deal with some emotional trauma. 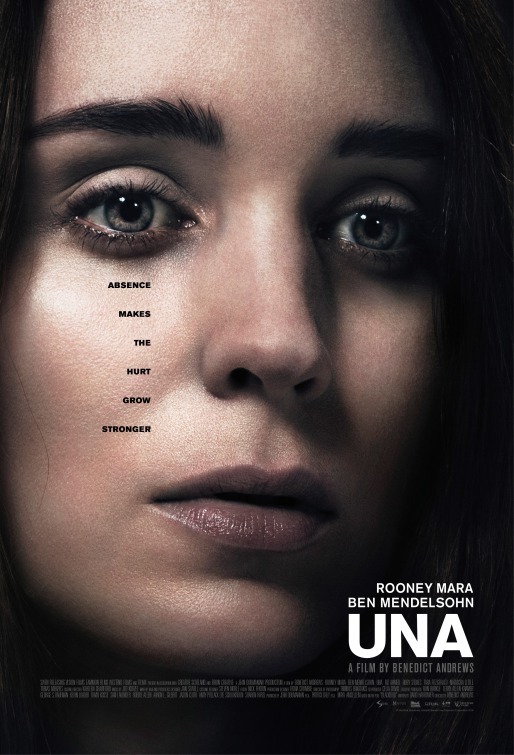 The first domestic U.S. trailer starts off with Una, still a child, testifying at the trial of the man who abducted her. Cut to her as an adult on the search for Ray and finding him living under a new name. She’s looking to confront him about what he did all those years ago and get some answers about why he did it. There’s obviously a lot of anger that she wants to get off her chest. This is a much better effort than some of the earlier foreign release trailers, though they served to create awareness and keep the movie top of mind in the audience. Mendelsohn and Mara are both giving emotional performances, though hers is a bit more external than the internalized fear and regret he’s showing. The subject matter is, of course, disturbing, but it looks like a compelling and gripping story. I couldn’t find a website for the movie, either on its own or on the sites for Swen or any other company involved in its U.S. release. There were a couple social profiles, but both seemed questionable for various reasons. Barring any other evidence, I’m saying there’s no official online presence for the movie. Photos appeared in Entertainment Weekly ahead of the movie’s Toronto Film Festival debut that provided the first glimpses at both Mara and Mendelsohn. The movie was also among those selected for the Telluride Film Festival. While that Toronto appearance didn’t get universally positive reviews it did highlight the impressively deep cast that had been collected, something that Andrews talked about since it was quite a feat, especially since most of these actors are at the height of their buzz at the moment. While the movie wasn’t screening at Sundance, it did get picked up by Swen during that festival in what was seen as the distributor’s first big move into the U.S. market. Swen eventually agreed to release it in the U.S. and gave it a fall premiere. Mara was the feature of a Vanity Fair cover story where she talked extensively about the movie as well as her career in general and her overall outlook on life. It’s not easy selling a story involving predatory sexual assault, which is absolutely the term to use when an older man preys on a teenage girl. Usually these stories involve dramatic quests for revenge or justice denied someone by the courts. Any story is going to come under fire for presenting a single point of view, one that may not be shared by all survivors of such trauma. What the campaign does well is keep the focus on Mara’s Una. That seems commonsensical, of course, but it’s nonetheless notable for having actually been executed. It’s clear that she’s not only on a journey seeking answers but that she’s not sure what to expect when she reaches its end. Mendelsohn’s Ray, for his part, isn’t presented as a cipher for all that’s bad and creepy about men but about someone who did a very bad thing and has tried to pick up his life in the wake of that. Such an approach may seem like cheap rehabilitation of a sexual predator, but it’s likely the movie itself has angles that aren’t apparent in the marketing. You actually make it appear really easy with your presentation however I find this topic to be actually something which I believe I’d by no means understand. It kind of feels too complicated and very large for me. I’m taking a look ahead for your subsequent put up, I will attempt to get the cling of it! I have been exploring for a little for any high quality articles or weblog posts in this kind of space . Exploring in Yahoo I ultimately stumbled upon this web site. Studying this info So i am glad to show that I’ve an incredibly just right uncanny feeling I discovered just what I needed. I so much surely will make sure to don’t forget this web site and provides it a glance regularly.